I LOVE chalkboards. I'm sure many of you out there cannot stand them.....because they can be messy. Messy? Maybe. Probably more so if you have kids writing & erasing constantly. I keep mine pretty clean, even though I don't use it that much. You see, my DIY chalkboard is in a space in my kitchen that may be too far off to always remember to write on it. Unfortunately, my kitchen doesn't have a lot of wall space. If it did, I would use the chalkboard more often. We mostly use ours (my husband & I) to leave each other LOVE NOTES....so it does get some use! 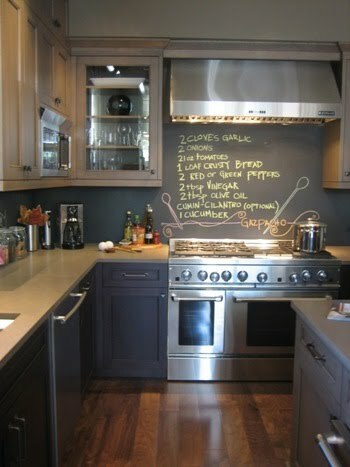 I really like the idea of using the chalkboard as a back splash, like in the photo below. 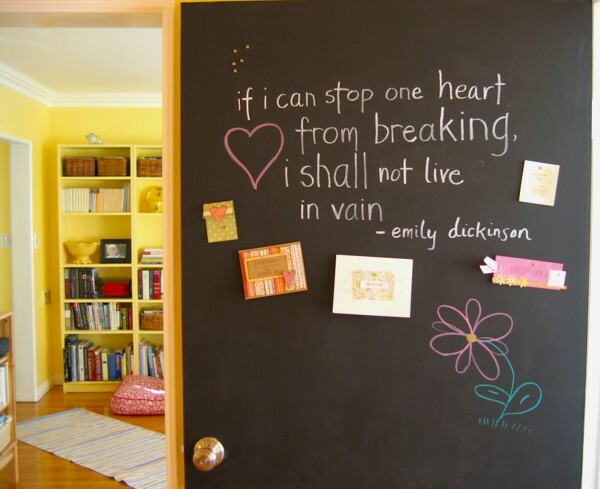 How do you feel about chalkboards in your home? Do you have one? 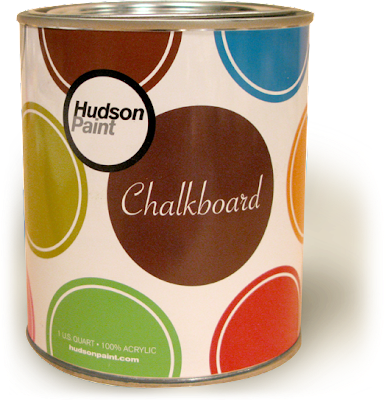 Get your own chalkboard paint from Hudson Paints. They have a ton of colors! I have a chalkboard in my kitchen and I love it! I write things on it almost every single day. Well I have to say, " I love chalkboards":) I have many chalkboards in my house and sell custom made chalkboards on etsy, framed and unframed! I LOVE the backsplash chalkboard!! I may have to do that in my kitchen. 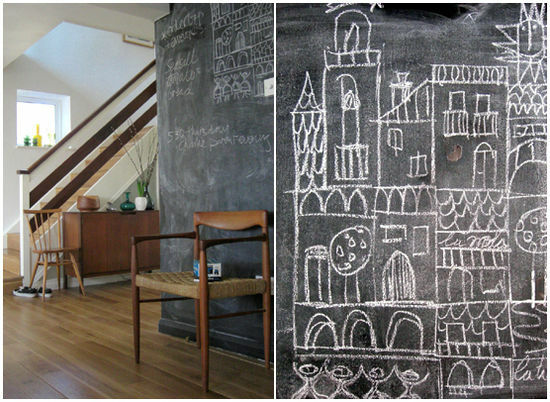 Chalkboards + dust allergies= I will never have a chalkboard in my house! our landlord let us use chalkboard paint on our pantry door (http://www.flickr.com/photos/corriejay/4153246106/in/set-72157623037723078/). he's a chalkboard fan; he's placed several strategically on our porch and in our shared outdoor spaces. i don't find it that messy. when i wipe it off i use a damp rag to reduce excess dust. I love chalkboards too. We're planning to have a lot of them, we have four kids and are big kids at heart too. The one in our kitchen currently has a love note to me from my husband but also gets used for weekly menus, shopping lists and reminders. nothing is more fun for a creative gal like me. currently working on finding a frame to create a DIY one.. I don't think I'll ever tire of chalkboard paint. I've got two homemade ones in my house and we all love them! It's sooo nice and useful by having a chalkboard at home, I'll definately have one when i have my own home sweet home and lil' one. I love them! I have had them in most houses, but recently painted over one as I re-did the room with a mural. Now I just need to find a new spot! We had house rules on ours. Always got a laugh because no one really took notice of them. Was fun though! i recently painted the walls in my powder room with chalkboard paint. i have always wanted a black bathroom and the chalk board paint has a great matte finish and makes it so fun! we wrote a letter to santa on it for christmas and i write directions for my children on it like, 1. potty 2. wipe 3. flush 4. wash hands 5. dry hands. they love it! someday i'll post pics on my blog. I love your chalkboard wall...and all your photos!!! I think I would love the wall even more than the children. chalkboarders unite! 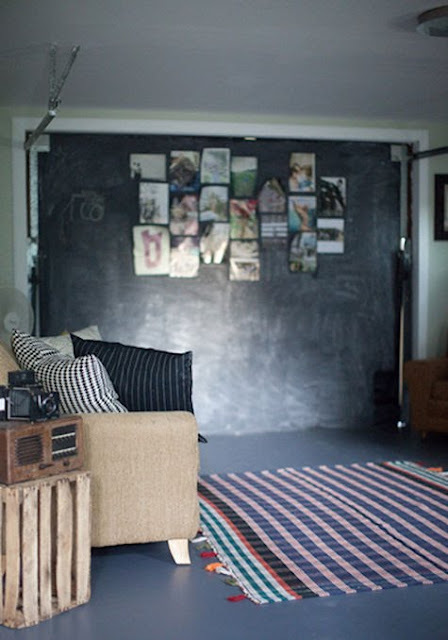 I love the idea of having an office with chalkboard & corkboard walls - so easy to put it all up! Elisabeth that is a super idea -bathrooms and chalk go together. I LOVE the chalkboard above the bed idea. So gorgeous. I love chalkboards! My kitchen is shared space, but I aspire to having a chalkboard there eventually. My son's room is having a redo planned and a large part of the lower walls will become chalkboard there as well! I have a couple vintage schoolhouse chalkboards. One in the kitchen and one that came with the house ( an old apple farmhouse) in the pantry.I love that we can put reminders or just change the message to suit our mood. Fantastic post. We are in the process of redoing our kitchen and i am actually doing the door of our pantry with chalkboard. Its an easy project and i love the final results. I also love old vintage frames and have made a few for friends. 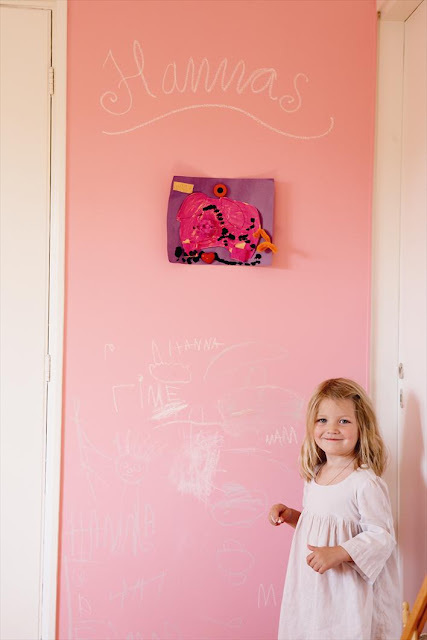 I do love love the pink chalkboard...how sweet for a little girls room! Thanks so much for sharing! Chalkboards really are awesome. I hope to have a wall of one in my future home. I love it! I have just come across your site for the first time and it's brilliant. I think every house should have a chalk board! We have several walls painted in chalkboard paint...but my fave is the pocket door...it usually stays hidden....but fun to pull out. I just painted the side of a tall cabinet in our recent laundry room re-do too. So...yep. All over! Love many of your images! I love the chalkboards around the house! I could find use for them all! 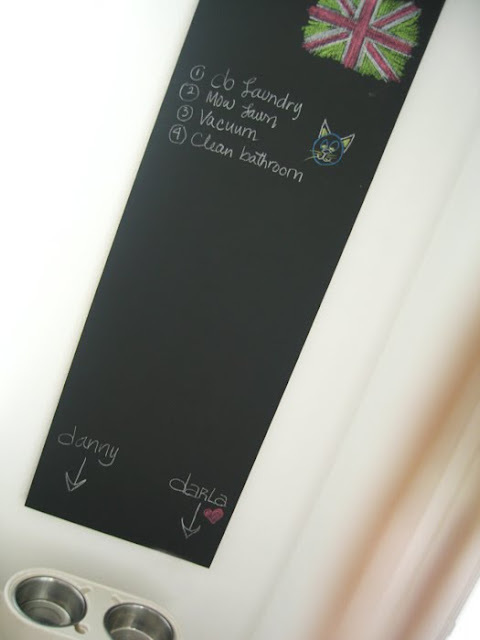 I bloody love the idea of chalk boards around the house - but the cleaning up part is a pain (from experience). They make quite the statement though, don' they? I love chalkboards as well!! well not may be in the bedroom but in thge kithen is a must or maybe kids room.. I mean how can you deprive the of the fun of writin with chalk and exploring their cretivity and the mess omes along with it!! Ooooh I would love one for my kitchen, might have to treat myself to one :]. So cute that you and your husband write love notes! oooh chalkboard above the bed would be messy ... i can only imagine the dust falling all over that beautiful bed. BUT you can always put a chalkboard or chalkboard paint onto a cabinet or two in the kitchen. You don't have to do them all, just one at each end or two on top of each other! Love the chalkboards...i want one in my kitchen now too! I love the collection of images. I think they are great but i would forever be drawing and writing on mine. I do love the magnet boards. Great collection of shots. LOVE chalkboards! I LOVE the chalkboard as a backsplash! I know a lot don't like them and they're probably on their way out, but I love them and am still looking for a great place in my house to paint one. I love chalkboards. I always see them in Home Goods, but I have not purchased one yet. I think, after seeing this post, I will get one. If my mom would of been able to paint a wall a chalk board, I probably wouldn't of colored on the walls!!! 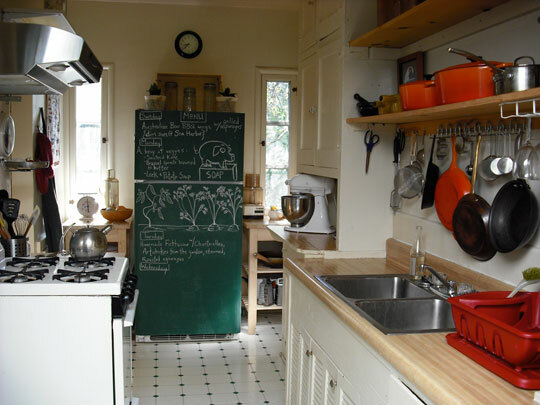 I think your kitchen chalk board is a great idea and so unexpected. I think I am a little obsessed by chalkboards. I love them in any form. My old job of 11 years, as a restaurant manager meant I had to write atleast 6 huge chalkboards a day, often from a very tall ladder. my tip: Keep your chalk in a glass of water. When you right on the board it will look almost invisible and when it dries it is bright white and really stands out. 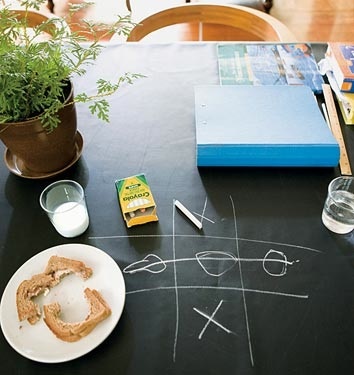 To wipe it off and get the board really clean, use lots of water and dry instantly, or use COKE (the drink, obviously). This is my current fave. I painted the end of an upper cabinet in my kitchen with chalkboard paint and I love it! I use it for grocery lists, reminders, as well as seasonal scribbles (right now it has a snowman drawn on it with snow flakes falling all around.) 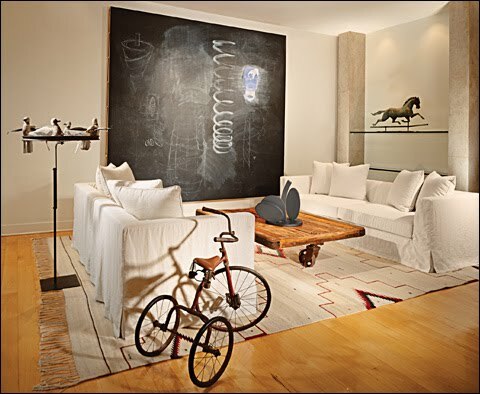 The possibilities are endless when it comes to incorporating them into your home! I love this idea. I have been trying to figure out where to put a chalkboard in our house, now I know! I bought an old, huge beautifully framed oil painting, for my sister, who was looking for a chalkboard for her house. Then she liked the painting so much she never used it!! It was a steal. Thanks for the great ideas! ELISABETH (BOVAGOODS)- Oh that sounds cute...chalkboard in the powder room! I really like the idea of leaving instructions/directions for children on there...if I had some of my own, I'd definitely do the same! APOTHECARY FOX: I didn't know that.. WOW! Thanks for the tip..now others can use this to keep theirs nice & dust free. :) thanks! Must love chalkboards! They are so much fun! I recently painted one in my kitchen nook. My hubby and I also use it mainly to write love notes. My nieces and nephews think I am the coolest aunt for letting them write on my walls; who cares about the mess! Your blog is awesome. It's so colorful and pretty! 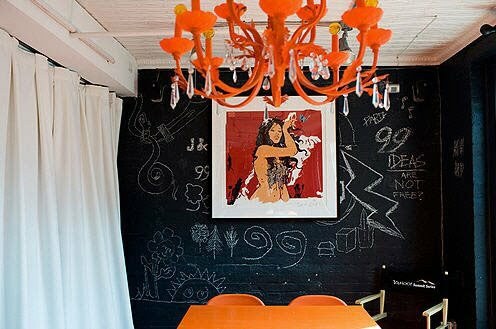 I can't WAIT until M & I own a house so I can crack a can of chalkboard paint!! I LOVE Chalkboards!! My friend always has the weekly menu listed on hers in her kitchen. We are remodelling a home and chalkboard is a must. Great photos as usual. I painted a chalkboard memo area in a bedroom. While it was handy for notes, the clean up wasn't! Next time, I'd do it in a place where there was easy access and a "drop" area that would clean up quickly. Well, now it's past. Hehehe. Thank you Jen!! I just placed my order for Genius Pink from Hudson for my daughter's 'to-be' playroom.... hoping the genius will rub off on her, hahaha! ...at least your idea was genius :) Thanks! 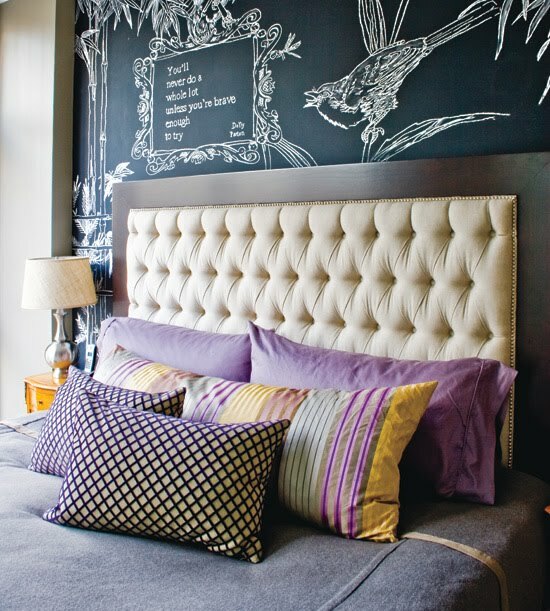 I love chalkboards, I have one in the wall in my kitchen, I also love the ideas of a feature wall behind the bed. Floor to ceiling? WOW sounds nice...send pics my way...if i like, will post 'em. I never knew chalkboard paint came in so many colors. I can't wait to get diy a chalkboard in my space. I love my chalkboard wall and I gave my nephew one too! I have not read all the comments but I just recently bought chalkboard markers. They are quite bright and no dusty chalk is involved. So it is a better option for those of you (me included) who are allergic to dust. I linked to this blog post today. I recently just finished my third chalkboard wall in my home (a little excessive? I think not!). I just found your blog today by finding pictures on the internet. Love all those images!